No wonder there are those who want his head in Parliament! Members of the Francophonie summit have agreed to a compromise on a contentious resolution after Prime Minister Stephen Harper blocked the original proposal. The original wording of the resolution recognized Lebanon’s suffering in this summer’s 34-day conflict, but not Israel’s. Harper took a strong stance against the Egyptian-proposed resolution which most of the 72 members supported. He urged the organization to recognize the suffering of both nations. After returning to the conference table to hammer out the wording of the resolution, the French-speaking states eventually agreed unanimously to support a compromise that called for the end of hostilities and a return to calm. 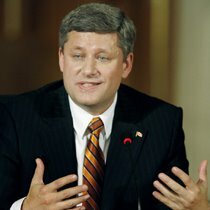 Harper found himself fighting against what French President Jacques Chirac called “a great majority” of the 53 member states at the conference when he took a stand against a statement of sympathy for the civilians in Lebanon because it made no mention of the Israeli civilians displaced, injured or killed in the month-long war. Canada’s rookie prime minister vetoed a last-minute Egyptian-sponsored amendment to a statement which said that the Francophonie “deplored” the effects of the war, which killed 1,500 people. The amendment did not recognize Israeli suffering. “The amendment wants to recognize and deplore the war and recognize the victims of Lebanon. We are able to deplore the war, we are able to recognize the victims, but on both sides,” Harper said at a news conference near the end of the two-day summit.